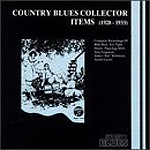 CD review: "Country Blues Collector Items (1928-1933)"
This review first appeared in the Spring 1993 edition of Blues Revue Quarterly magazine (now Blues Revue). This compilation presents the complete surviving recordings by six relatively unknown blues artists recorded in the late 1920s and early 1930s. All 18 tracks were laid down in Atlanta, Chicago or Richmond, Ind. Considering that this release was taken from 78s, the sound quality is very good and quite listenable. Only Too Tight Henry (Henry Lee Castle), who toured in a trio with Blind Blake and Blind Lemon Jefferson, is at all a familiar name to any but the most devoted blues aficionado. In fact, the liner notes only list biographical sketches for Castle, James "Bat" Robinson and Archie Lewis, before concluding with this passage: "Regrettably, no information was available for performers in this collection omitted from these notes." None of which should reflect on the music. In the interwar period, luck had as much to do as ability in whether a blues artist was recorded or not. Regular talent searches did not yet exist, and blues was limited to the smaller "race" labels marketed for blacks. Troy Ferguson exhibits an amazing vocal range, from the near-baritone he achieves on "Good Night" to the sweet tenor on "College Blues." Ferguson was also equally at home on both piano and guitar. His guitar playing is fairly straight-forward  with an emphasis on rhythm, and the leads worked in over that  but his piano combines elements of ragtime and the then-still-developing stride style. Papa Egg Shell (Lawrence Casey) was a nimble guitarist with a nasal, tenor voice. His guitar solos sill sound modern and contemporary 70 years later. His songwriting was also strong, as "Goin' Up the Country" is far more accessible than that of much music from that era. Bill Bird is most noteworthy for his quavering tenor voice which, when he hums, sounds remarkably like a harmonica.. While he's represented by four songs here, all are variations on the same theme with different lyrics. As noted, the sound quality acceptable; the recordings rare. This is a quality entry in DA Music's Story of Blues series and showcases little-known blues artists who may be just as representative of the music being played between the wars as those musicians who were recorded more.